Santa Monica, CA – Four leading thinkers in public finance and park development are gathering in Santa Monica to help figure out how the city can cover the costs of replacing the airport with a park. 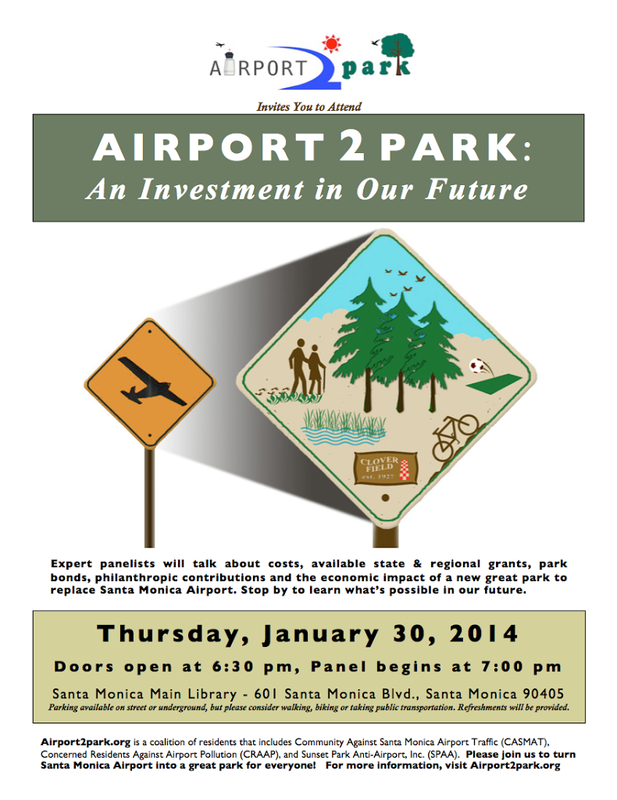 The public meeting and panel discussion, to be hosted by former Santa Monica mayor Michael Feinstein and sponsored by the organization Airport2Park.Org, takes place at 7 pm next Thursday evening, January 30th, at the Main Library. The panel will include Esther Feldman, President of Community Conservation Solutions, who’s generated over $3 billion for parks, beaches, rivers, and urban recreation in Los Angeles County, and who launched a program that created a $35 billion fund for conservation projects nationwide. Also on the panel will be Sherrill Kushner, who chaired the campaign that passed a Santa Monica library bond with 81% of the vote, former Santa Monica Recreation and Parks Commissioner Neil Carrey, who’ll address the possibilities of philanthropic contributions to the park project, and David Goddard, Chair of the Santa Monica Airport Commission, who’ll talk about how much revenue the city could realize by repurposing airport buildings now used for aviation purposes and re-leasing them at market rates. According to Airport2Park, the city-owned and subsidized general aviation airport is conservatively valued at $2 billion, but is used by only a very few people who fly there. The panel discussion, open to the public and entitled “Airport2Park, an Investment for the Future”, will take place Thursday evening, January 30th, in the Martin Luther King, Jr., Auditorium, at the Santa Monica Main Library, 601 Santa Monica Boulevard, Santa Monica. Doors will open at 6.30 and the program will begin at 7:00. Neil Carrey was a Santa Monica Recreation and Parks Commissioner for more than 12 years and served as Chair or Vice-Chair for a number of years. Projects planned while he was a commissioner include the Virginia Avenue Park expansion, Airport Park, Euclid Park, the Annenberg Beach House, Tongva Park and the Universally Accessible Playground. Mr. Carrey is an attorney with the law firm of Baker Hostetler; among his areas of expertise are forming and representing nonprofit organizations and private foundations, and he has also sat on many nonprofit boards, often in an officer position. Mr. Carrey chaired the committees formed to campaign for three successful bond issues for the Santa Monica-Malibu Unified School District and has chaired many advisory committees for the district. Esther Feldman, President of Community Conservation Solutions, has a long history of pioneering new conservation initiatives that successfully address challenging environmental problems, and is adept at leveraging funds to ensure the longevity of the projects she directs. She is responsible for generating over $3 billion in public funds throughout Los Angeles County, California and the United States to protect parks, beaches, rivers and natural lands, and provide urban recreation facilities. The National Public Finance Program she launched at the Trust for Public Land has created $35 billion in new conservation funding nationwide. As President of Community Conservation Solutions (CCS), a non-profit organization that tackles the challenging problems created where people and nature intersect, Ms. Feldman conceived of and spearheaded the two-square mile Baldwin Hills Park Project in the heart of urban Los Angeles, launched wetland restoration efforts in Upper Newport Bay. She is leading a restoration project on the Los Angeles River, and has developed a metrics-driven ‘Green Solution’ tool to help decision-makers solve stormwater runoff and water supply problems and is working to develop regional funding solutions to implement runoff capture projects. Esther has a B.S. in Soil and Water Science from UC Davis, and is an avid outdoors woman. David Goddard, a 16-year resident of Santa Monica, is the Chair of the Santa Monica Airport Commission and has served as a Commissioner since 2011. He is a founding member of Airport2Park.Org and a member of Friends of Sunset Park. He has 30 years experience in the institutional financial services and real estate industry as both a chief operating officer and a chief financial officer. Sherrill Kushner, 35-year-resident of Santa Monica, chaired the campaign for the city’s library bond in 1998 that passed with 81% of the vote to fund the building of a new main library and make improvements at the branches. She is also a board member of the Santa Monica Conservancy and Santa Monica Coalition for a Livable City, a member of the League of Women Voters of Santa Monica, and works as an immigration law attorney. The event will be hosted by Michael Feinstein, a 30-year resident of Santa Monica, who served on the Santa Monica City Council (1996-2004) and as Mayor (2000-2002).